Getting a bit tired of cutesie games like Snipperclips, Arms and 1-2 Switch on Nintendo Switch? Is Splatoon just a bit too touchy-feely for your liking? 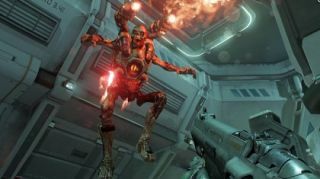 Good news, then: Bethesda is bringing DOOM, one of its best (and possibly bloodiest) games from last year to the Nintendo’s new console, alongside Wolfenstein II: The New Colossus sometime in 2018. The two games join fellow Bethesda title, The Elder Scrolls V: Skyrim, which will arrive on the Nintendo Switch on November 17. For one, it means that Nintendo Switch is getting one of the best games of 2016 which, in and of itself, is a big deal. But two, it means third-party publishers are returning to a Nintendo system after distancing themselves during the Wii U years. Finally, these games actively confront the idea that Nintendo consoles skew towards a younger audience. That's worth mentioning because, although a fair amount of people under the age of 18 do own the system, according to data released by Nintendo, 46% of Nintendo Switch owners are ages 25-34. Does that mean Nintendo’s likely to go full NC-17 anytime soon? No. But it bodes well that companies like Rockstar and Bethesda are actively combating that stigma and keeping an eye on Nintendo – especially while they’re creating the next generation of Grand Theft Auto and Fallout.